This past fall, ToNeTo Atlanta uncovered the first few tenants planned for the massive new City Springs development in Sandy Springs. We honored the request of Selig Enterprises in not releasing those names at that time as some leases were not yet finalized. While it has it has been tough sitting on such exciting news, we are pleased to say the ink is dry and the City officially announced today that a number of new restaurants will be opening in the mixed-use development. Flower Child, a healthy quick-serve eatery from Phoenix, Arizona-based Fox Restaurant Concepts, plans to open in a 3,495 square foot space along Johnson Ferry Road. This will mark the second location for Flower Child, the first is currently under construction in Buckhead at the Shops Around Lenox and is expected to open next month. Flower Child is essentially a scaled down version of Fox's other healthy concept, True Food Kitchen, with one Atlanta area location at Lenox Square in Buckhead. Flower Child specializes in bowls, wraps, soups and salads as well as kombucha on tap. The Select from the creators of Paces & Vine in Vinings is also coming to the project and will occupy a 4,457 square foot space along Galambos Way, a new street named for the late Eva Galambos, Sandy Springs' first mayor who passed away 2015 at age 86. The Select "will be known for a light interpretation of contemporary American comfort food with an outstanding wine list." A representative from The Select indicated the restaurant will be similar to Paces & Vine, but "more upscale." The introduction of The Select, which will ultimately likely be quite similar to Paces & Vine, seems similar to what neighboring eatery Breadwinner Cafe did when they introduced Farm to Ladle to Ponce City Market when the development asked that they create a "unique" concept. The Select will have seating for about 170 patrons and will reportedly keep its bar open until as late at 2AM on weekends. Café Vendôme will also open in the City Springs development, marking the local bakery's second location in Sandy Springs and second overall. The cafe's existing location is situated on the back side of Belle Isle Square on Roswell Road across from Fountain Oaks shopping center. Café Vendôme specializes in handmade French pastries as well as quiches, sandwiches and coffee. NAM Kitchen from Alex Kinjo of MF Sushi will mark its return after a seven year absence. The original NAM, located in Midtown Promenade in Midtown, opened in 2003 and closed January 1, 2011, when the restaurant's lease expired, according to ownership. Kinjo said at the time that NAM would reopen, but he didn't say when. 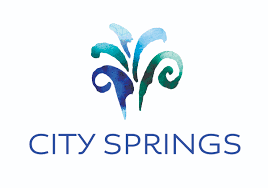 City Springs seems to be the realization of that promise. The new NAM, now NAM Kitchen, will feature a similar but more "curated" menu, according to Alex Kinjo. Thuy Bich will be the restaurant's Executive Chef with a menu of traditional Vietnamese classics as well as a full service bar featuring craft cocktails. Vida-Flo, a rehydration center will also open in the complex. Sculpthouse founder Katherine Mason is a Vida-Flo "aqua ambassador" according to its website. This will mark Vida-Flo's fourth Atlanta area location following centers in Brookhaven, south Buckhead and Virginia-Highland. Previously announced tenants SculptHouse and TURN Studio are reportedly already underway with their buildout and both expect to open in mid-to-late summer. SculptHouse, an Atlanta-based fitness business, will also open in the project. Slated to occupy a roughly 3,200 square foot suite alongside Flower Child, the City Springs SculptHouse will be the business' first franchised location. The original SculptHouse opened in early 2016 and is located in Buckhead Exchange at the corner of Grandview Avenue and Peachtree Road in Buckhead. SculptHouse features a variety of cardio and strength classes as well as a small boutique featuring athleisure apparel. TURN Studio is a new indoor cycling and strength training facility that will open in a roughly 3,200 square foot space alongside The Select. Two other spaces, likely to be occupied by retailers, remain unleased, although there are reportedly a number of interested tenants vying for the final spaces. All restaurants are expected to open in "late summer." Lanier Parking manages the self parking, metered parking and valet parking for the complex and indicates that there will be about 800 spaces available for visitors. Patrons will be provided with two hours of complimentary self parking after which validation from restaurants may be offered for any additional time. The $229 million City Springs complex — located between Johnson Ferry Road and Mount Vernon Highway at Roswell Road — also includes a new City Hall, a Performing Arts Center [Sandy Springs Theatre Company], a park and apartments. City Springs is largely comprised of land previously home to Target (former Richway) and Goodwill (former Harris Teeter/A&P). A Waffle House and a former Church's Chicken that was operating as a Mediterranean eatery both also closed/relocated to make way for the project. Are you excited about the restaurant announcements at City Springs? What else would you like to see open at City Springs? What is your favorite Sandy Springs area restaurant? Anything Fuqua and Selig Enterprises do is ridiculously boring. They are the worst. No imagination in design!! Damn! It is another town brookhaven/Emory Point! Zzzzzzzz .... All that money and my 5th grade son could have done the layout for six flags season tickets!